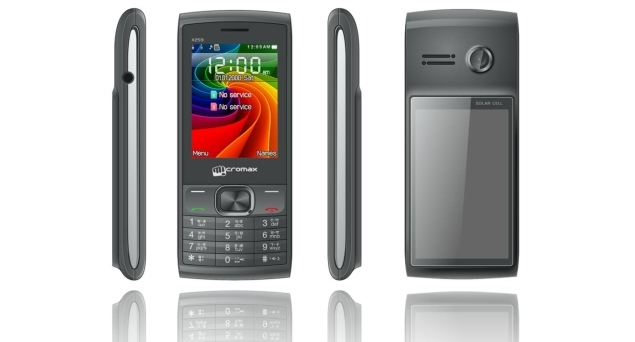 The Indian manufacturer Micromax has announced the launch of X259 handset, which comes with a built-in solar panel. Priced at Rs. 2,499, it is the first solar phone from the company.The built-in solar panel allows the phone to get automatically charged when exposed to sunlight. It is targeted to rural consumers, who constantly grapple with power cuts over long durations. According to the company, three hours of solar charge provides 1.5 hours of talk time on the phone. Micromax X259 also features a 2.4-inch QVGA screen with a resolution of 240x320p, 1000mAh Li-ion battery and dual-SIM dual-standby feature. The handset also supports Bluetooth connectivity. "We have been at the forefront of innovation. We have introduced many categories into this competitive Industry be it long battery life phones or dual SIM phones. With the introduction of this our intent is to get rid of the mobile phone charger by including a solar panel on the device itself," stated Rahul Sharma, co-founder, Micromax. 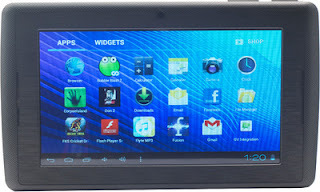 The Lava E-Tab Z7H is a tablet that caters to customers who want to enjoy the benefits of an ICS running tablet, without having to dish out a fortune and when you have a tablet that runs on the Android 4.0 (Ice Cream Sandwich) operating system you can always expect a host of fun features. Powered by the 1.2 GHz Cortex-A8 processor and with 512 MB DDR3 RAM, the E-Tab from Lava is all about a fast and efficient user experience. What you have to love about the Lava E-Tab is its 7 inch TFT LCD capacitive touchscreen which makes interacting with the table absolutely effortless. This sensitive Multitouch Screen allows for advanced functions such as pinch to zoom and makes navigation smooth and easy. The screen supports 800 x 480 pixel resolution and graphics are supported by Mali-400 3D as well as OpenGL VE 2.0, giving you exceptional clarity and fluidity of motion. The Lava E-Tab also has the unique Flick Technology that makes playing games, browsing through pages and entertainment a whole lot more fun on the tablet. The 0.3 megapixel camera on the Lava E-Tab allows you to capture those memorable moments in vivid colours and with the video recording feature you can capture clear and crisp videos and watch them in full HD playback. You can carry your memories with you wherever you go and keep adding new ones to your collection. The E-Tab has a bold bar design that is smart and compact and resonates convenience. 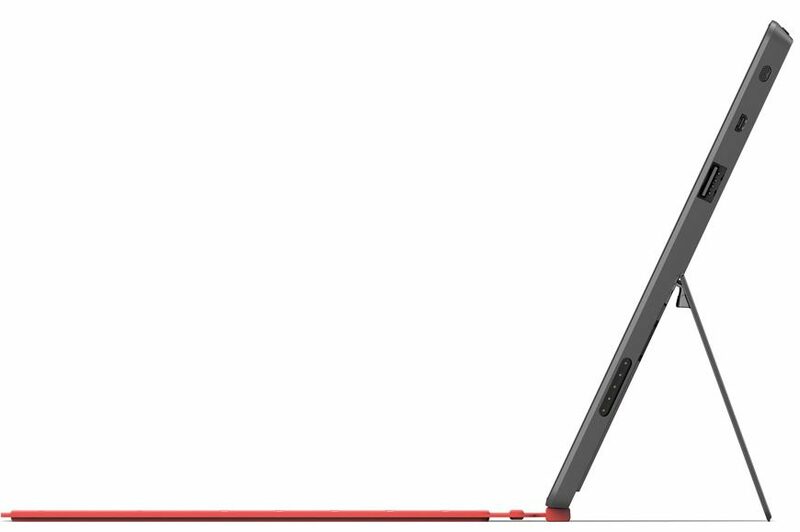 The E-Tab Z7H measures 122 x 204 x 11.9 mm in dimension and weighs 350 g, making the tablet very easy to carry with you. The tablet is equipped with the G-Sensor that allows for easy toggling between applications and also gives you the best view on the screen. The Android Lava E-Tab Z7H runs on a powerful 2800 mAh Lithium - Ion battery that offers reliable battery support, letting the Tablet give you company for the long hours that you want it to. The Tablet has an inbuilt memory of 4 GB and the memory can be expanded up to 32 GB using micro SD or micro SDHC cards. 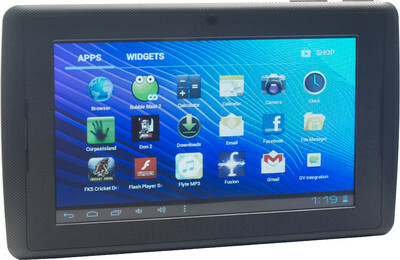 You can stay connected to friends and family and send and receive email with ease on the Android Lava E-Tab. The E-Tab is enabled with Wi-Fi allowing the Tablet to hook up to the internet in a Wi-Fi zone. The tablet also allows you to use the internet using the 3G USB Dongle Support. 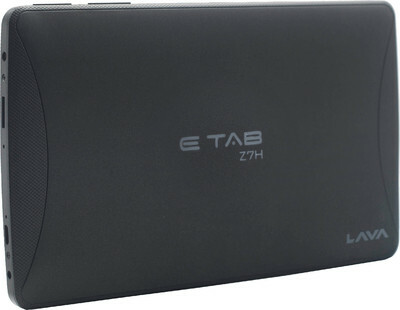 The Dongles supported by the E-Tab Z7H include Airtel 3G E1731, Idea 3G E1732, Reliance 3G MF190, Reliance Netconnect+ EC150, MTS Mblaze AC2746, TATA Photon+EC156, TATA Photon+EC1261 and LAVA 730G. You can easily connect the E-Tab to your laptop or PC via micro USB port and you can connect your headphones to the tablet using the 3.5 mm audio jack. Navigation in your city or even an unknown one is a piece of cake because the E-Tab is enabled with Google Maps, making it a great travel companion. The E-Tab Z7H also comes preloaded with apps that we love to use like Orkut, Twitter, Facebook, YouTube, TOI, Nimbuzz, Google Search, Flyte Flipkart Music App, Gmail, Google Latitude and Google Voice Search. The Tablet has games and movies and for those of you who love to read on the go, the Tablet comes preloaded with 14 books. Overall, the Lava E-Tab Z7H that delivers powerful performance and offers connectivity and entertainment in a single touch. Above all, the Lava E-Tab is a quaint device that you can own for a fraction of the price of ICS running tablets. 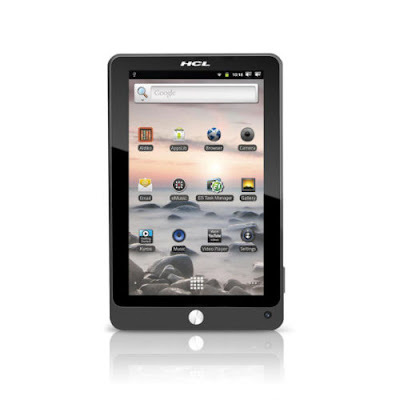 Running the Android v2.3 (Gingerbread), this latest multi-functional gadget from HCL Technologies is a user-friendly Tablet designed for productivity and entertainment. The HCL ME X1 is accelerated by a High-performance Cortex A8 1 GHz Processor, and comes with 512 MB DDR2 RAM. This is an added advantage, as DDR2 gives you faster memory letting you multi-task with ease. 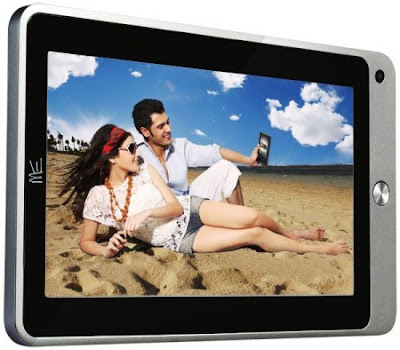 This HCL Tablet has a 7-inch Capacitive Multi-Touch display with a resolution of 800 x 400 pixels. With the Capacitive Multi-Touch technology the Tablet responds instantly and naturally to your touch. This enables various functions like pinching pictures to zoom in, tapping, dragging or swiping across the screen. This, in turn, gives you the freedom to spend more time reading, gaming and visiting your favourite sites without a hassle. The screen has a 16 x 9 widescreen aspect ratio. The Tablet is loaded with a 2 megapixel front-facing camera that is ideal for jitter-free video chatting through applications like Google Talk and many others. The camera also supports video recording. The X1 comes with a trendy, highly intuitive MELauncher User Interface that enables you to explore the Android Tablet smoothly. The HCL ME X1 has a dazzling, wide yet compact look and a smooth aluminium body. The sleek form factor of this Tablet measures 192.5 x 121.35 x 12.2 mm, weighing about 391.5 g only. Furthermore, the lightweight Tablet also has a G-Sensor that supports rotation of the screen based on your perspective when you hold the Tablet. This variant of the HCL ME uses a 3500 mAh Lithium-Polymer rechargeable battery that will last you a good 8 hours of battery life per charge. This can be charged through an AC Adapter that comes with the Tablet. The Tablet comes with an in-built 4 GB Flash memory expandable up to 32 GB via a microSD or microSDHC card as the device has a microSD slot engrafted in it. This gives you the liberty to store a large amount of data on your Tablet. For a speedy Internet connectivity, this Tablet supports Wireless 802.11 b/g Protocol for Wi-Fi access. You can connect this device to your PC, sync and backup the Tablet with your PC for seamless data synchronization. The HCL ME X1 is the first Tablet in the market that allows data connectivity through 3G USB dongles. The HCL gadget has a Mini-B USB 2.0 port as well as an mini HDMI port to connect audio and video sources. The Tablet also supports HD gaming. This Tablet is integrated with an internal microphone, saving you the trouble of attaching an external mic for audio or video conferencing. The device also has a 3.5 mm stereo headphone jack. This variant of the HCL ME series supports full HD 1080p video output, up to 30 frames per second. The Tablet comes integrated with Adobe Flash Player 10.3. This enables smooth viewing of expressive applications, content and videos across browsers and operating systems. Hence, you can keep yourself entertained by streaming Flash videos from websites such as YouTube, Megavideo, DailyMotion and so on. The ME X1 is ideal for productivity on the go as the device is preloaded with a Document Viewer and Editor, e-mail features, and also supports cloud computing. HCL has been smart in tapping the Indian market by including various applications from Indian firms such as Jeevansathi, Clear Trip, Hungama and some others. The Tablet also lets you stay connected with friends through built-in social networking apps such as Facebook and Twitter. Besides these, the HCL device also comes with the Fring Instant Messenger, through which you can chat with your friends on Yahoo, MSN and much more. With over 10,000 ME applications awaiting download, the Tablet covers all the significant features required for your leisure and professional needs. The HCL ME Tablet X1 gives you the liberty to carry your work as well as entertainment wherever you go, giving you the feel of a small computer in your hands. 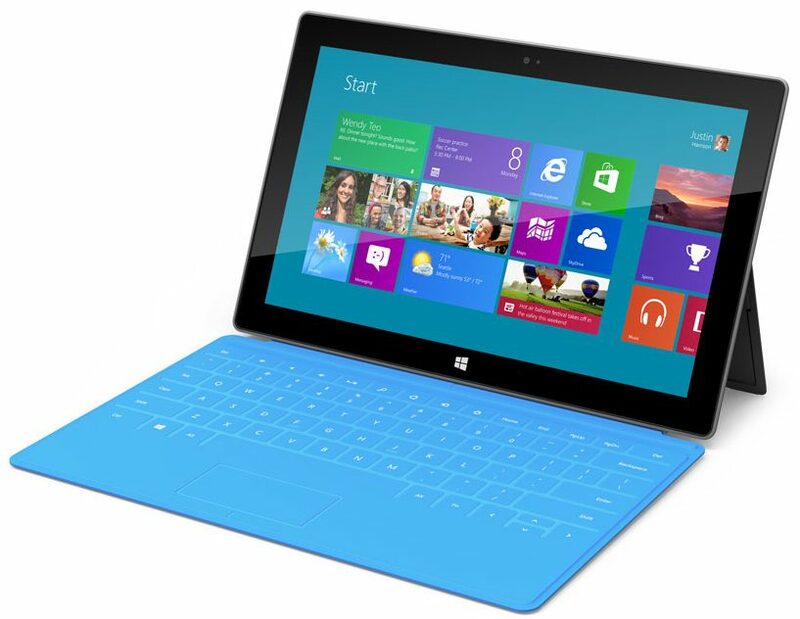 Microsoft announced a brand new line of internally-designed tablets at an event in Hollywood on Monday. The Surface tablets, as they are calling them, are extremely thin and light, and were designed with Windows 8 in mind. 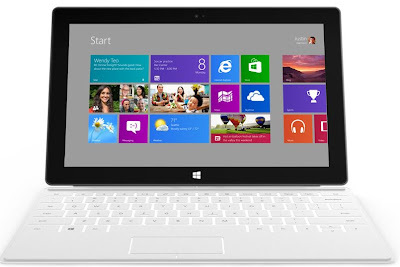 The Surface will be available in two versions, "Surface" and "Surface Pro". "Surface" will run the Windows RT operating system and use an ARM CPU. 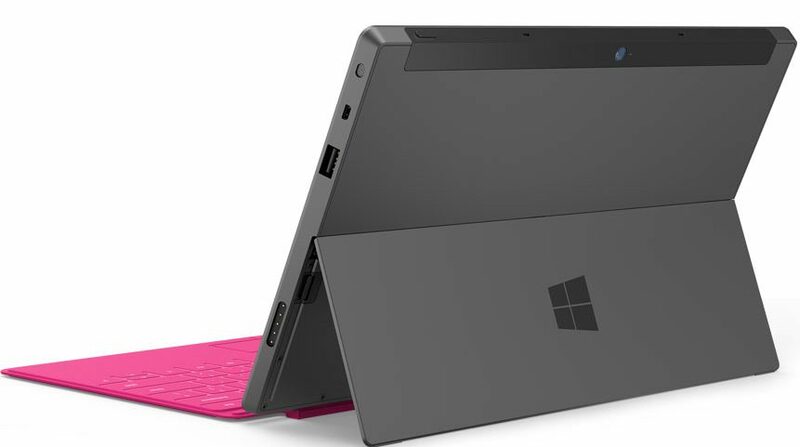 "Surface Pro" will run the Windows 8 Pro operating system and use an Intel CPU.The display is a 10.6-inch, 16:9 widescreen HD Display (Surface), or Full HD Display (Surface Pro) and have a built-in kickstands, the better with which to watch movies and TV shows. The screen cover detaches and works as a full-on keyboard and multitouch trackpad; there's a second cover that has an actual mechanical keyboard and clicking buttons. They're also fitted out with ports for the usual things: microSD, USB, video out. There are cameras on the front and rear for pictures and video, and the one on the front is actually angled a bit so you can talk while the tablet is leaning on its kickstand. Inside, you can get up to 64GB of storage on the RT and 128GB on the Pro. The RT tablets will be available when Windows 8 launches (supposedly in October), and the Pro tablets three months later. The price was not announced but according to me, it may cost around 40,000. 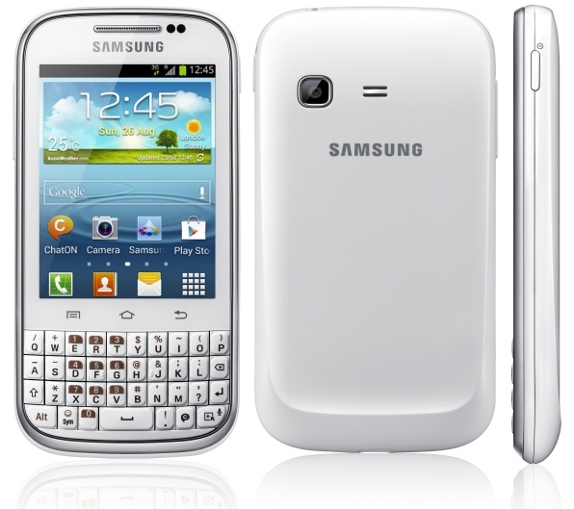 Samsung launched a new Galaxy smartphone on July 4, the Samsung Galaxy Chat. Featuring a 3-inch QVGA touch-screen and a dedicated QWERTY keyboard, it looks a whole lot like something that BlackBerry users might be interested in. Samsung Galaxy Chat is a low-end Android 4.0 running device. It has a 3" QVGA display and QWERTY keyboard and a microSD card slot for memory expansion. It has a 2MP camera at the back and also lets launch the camera or view your notifications directly from the lock screen. 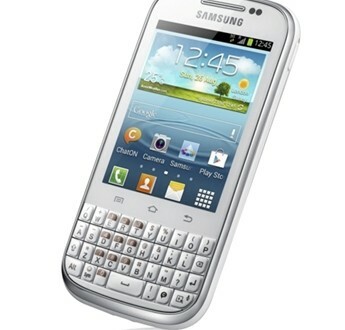 It has Samsung’s ChatON message and a dedicated key to access it. It weighs 112g and is just 11.7mm thick. It has 4GB internal memory that is expandable up to 32GB with microSD, but no details about the RAM yet. 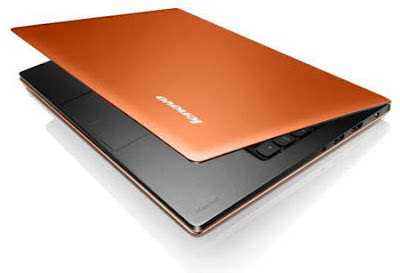 The connectivity features include, Bluetooth 3.0, USB 2.0 WiFi 802.11 b/g/n. It has 3.5mm Ear Jack, FM Radio with RDS, AllShare Play to share media, Game Hub to download games, S Planner app to manage your schedule and Quick Office application to view Microsoft Word, Excel, or PowerPoint files. It comes with 1200 mAh battery. The Samsung Galaxy Chat is expected to ship from July starting in Spain and would gradually be rolled out to Europe, Latin America, Middle East, China, Southeast Asia, and Southwest Asia. There are no details about the price yet. The BlackBerry® Curve™ 9380 3.2" all-touch screen is packed with pixels for a crisp, clear display and responds quickly whether you're tapping, swiping or zooming. 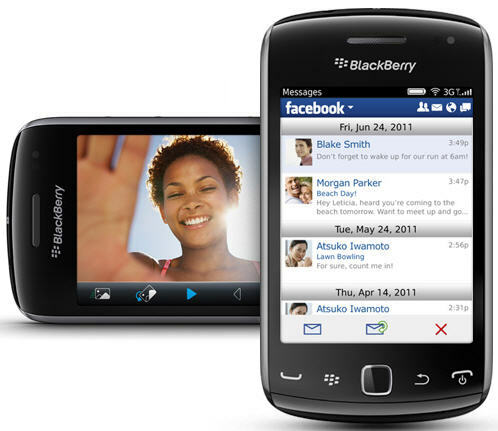 So it's easy to quickly skim and scroll through your BlackBerry® apps and icons, or zoom in on your friends' newest Facebook® pics. The curved, all-touch design creates a smartphone that's not only great to look at, but also feels just right in your hand. See all your friends' and family's updates on the BlackBerry Curve 9380 in one place so you can easily stay up-to-date with your social networks. You can also receive the latest news and information from your favourite blogs and websites. 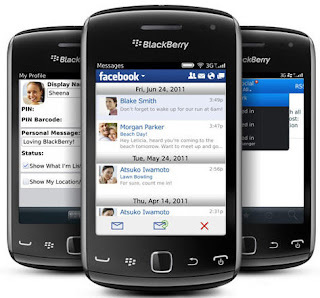 With the responsive touch experience, intuitive virtual keypad and optical trackpad, navigation on the Curve 9380 is a breeze, whether you're browsing the web or sending a quick BBM message. Take photos of your spontaneous moments with the 5 MP camera with flash. 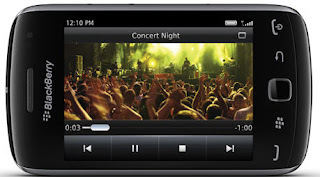 Or capture the play-by-play with the built-in video camera, and then easily upload your video to Facebook for all your friends to see. Let your friends know what's going on in your world with the pre-installed Facebook and Twitter® apps on your BlackBerry® Curve™ 9380 smartphone. Tweet, send and respond to messages, and update your status no matter where you are.